The first museum grade replica for "The Animal House" in the Bronx. Authentic to Tower Ladder 33 using over 785 hand-crafted parts. From the "33" on the front grill to the roof mounted stokes basket, this 1:50 scale replica emulates the real FDNY Tower Ladder 33. Our goal with each release is that our customers may notice something new each time they view the model. Intricately detailed, stainless steel parts for razor sharp precision. Tower Ladder 33 from the Bronx features impeccable detailing and true-to-scale parts that only stainless steel can provide. Fire Replicas has ushered in a new standard in 1:50 scale modeling that is sure to impress the most discriminating collectors. Only 125 units of Tower Ladder 33 have been produced. Fire Replicas are designed with the elite collector in mind, and manufactured in limited quantities to enhance long-term value. FDNY's Tower Ladder 33...preserved with pride and professionalism. 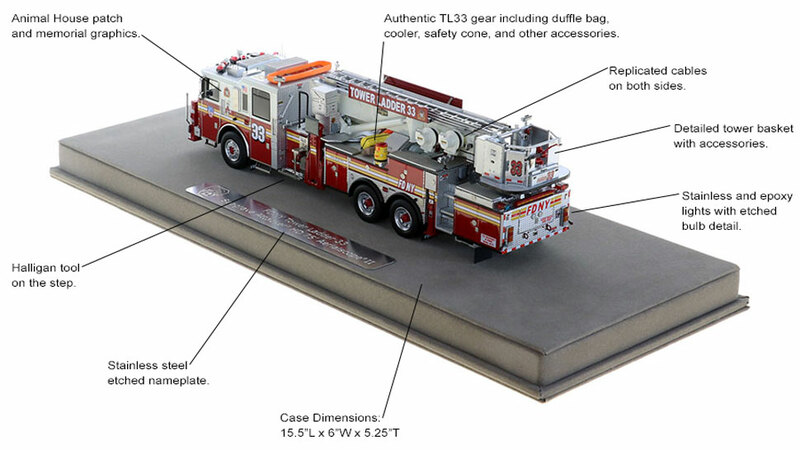 The FDNY Tower Ladder 33 replica measures 10"L x 2.5"W x 2.75"T and is securely displayed inside a custom case. The case dimensions are 15.5"L x 6"W x 5.25"T and the platform includes an etched stainless steel nameplate with the FDNY seal, department and truck name. This FDNY Tower Ladder 33 scale model is a museum grade replica of the FDNY Seagrave Attacker HD 75' Aerialscope II. Like all Fire Replicas models, every detail is modeled to perfection and with razor sharp precision. The replica features the specific department configuration and graphics, leaving no detail overlooked. The display case is custom manufactured with high quality acrylic and resin. The stainless steel etched plate features the department and truck name, and department seal. This replica is a treasure to be displayed and admired and is in no way a toy. All New York City logos and marks depicted herein are the property of New York City and may not be reproduced without written consent. ©2018. City of New York. All rights reserved. No idea how it's possible to still get better but also Tower Ladder 33 is an amazing release from Fire Replicas. Very precise work down to the smallest Detail and not only the Quality of the model is amazing also a big thank to Fire Replicas' ***** customer service. I like your product. I have only bought 2 so far but plan to keep buying when the extra money is there. But my only gripe is your packaging. In this day and age do you really need to use styrofoam peanuts. There messy and very bad for the environment. I know that there is other means of packaging material that can be used to secure your product. Please have your shipping personal look into this. Dan, thanks for your kind words and recommendation. We'll look into it, but are currently unaware of any affordable packing alternatives that will offer the compression damage protection needed for the display case. Thanks! FR. This model looks so realistic. The detail was amazing. Fire Replicas is just the best in the business. Worth every penny. Highly recommend. •	The overall casting is flawless which is why the fit and finish is so good. •	Parts count went from under 600 to nearly 800! It is difficult to describe the overall improvement in fit and finish, but the overall model is simply crisp, clean, perfectly assembled and spectacular. Overall detail is also improved and you get extra equipment as well. Specific to Tower Ladder 33: Stokes basket on cab roof, exhaust fan, big “33” on grill, safety cone and igloo water cooler. These details really add to the overall appearance of these models.